is a special formulation for stretch marks. It lightens the stretch marks & makes the skin smooth & supple. It?s a great skin nourisher enriched with the goodness of vitamin E & wheat germ.Gently massage the oil in a circular motion on the body. Apply before you sleep & after a bath. Use for six months for best results.Blueberry kit- Say hello to gorgeous skin with our triple-action skin care kit. Made from antioxidant-rich blueberries and Aloe extracts, our exclusive blend leaves skin feeling ultra-soft and shiny. Our luxury kit delivers an array of feel-good products to gently clean your skin while soothing Aloe nourishes your face. Your skin is left feeling dewy-soft and lightly scented with the luscious blend of blueberries.We believe that everyone deserves a little bit of luxury. Say hello to gorgeous skin with our triple action skin care kit. Made from antioxidant rich blueberries and Aloe extracts, our exclusive blend leaves skin feeling ultra soft and shiny. Our luxury kit delivers an array of feel good products to gently clean your skin while soothing Aloe nourishes your face. Your skin is left feeling dewy soft and lightly scented with the luscious blend of blueberries. We believe that everyone deserves a little bit of luxury. This Kit Contains the following, Cleanser - 100gm, Toner - 50gm, Moisturiser- 100gm. It?s a great skin nourisher enriched with the goodness of vitamin E & wheat germ. It lightens the stretch marks & makes the skin smooth & supple. 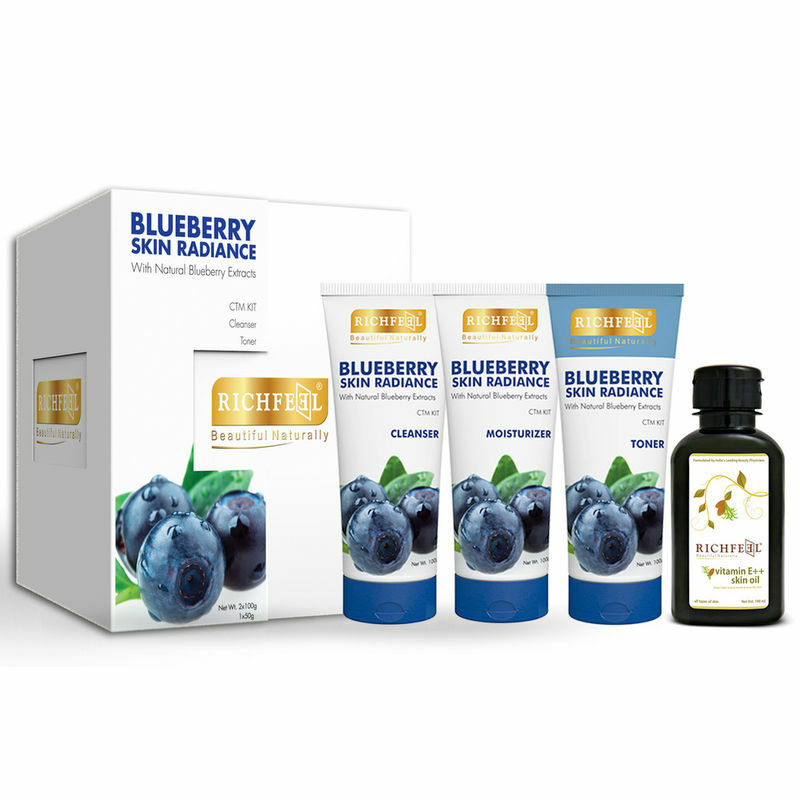 Blueberry - Say hello to gorgeous skin with our triple-action luxury skin care kit. Made from antioxidant-rich blueberries and Aloe extracts. Leaves skin feeling ultra-soft and shiny? UVA/UVB protection for all skin types. Unique triple-action: lightens skin tone, reduces marks & protect from sun. Provides quick and hassle free clean up post parties.